Early evening. I persuade a friendly Estonian officer who owns a kebab house to make me a fishburger. This being Estonia, there will always be a hunk of salmon lying around somewhere. This man has served in Afghanistan and in Africa, and will again. He takes me through his numbers: he has risked everything on this Kebab place, over a hundred km from his home. The economy of Estonia is not great. So risking his life to earn some money, then risking that money on a remote venture, is the only way he sees of escape. His restaurant is on the corner of this street. I like him, and would not want to live in his shoes. I pass an old cemetery marked by crumbling stone crosses covered in lichen. 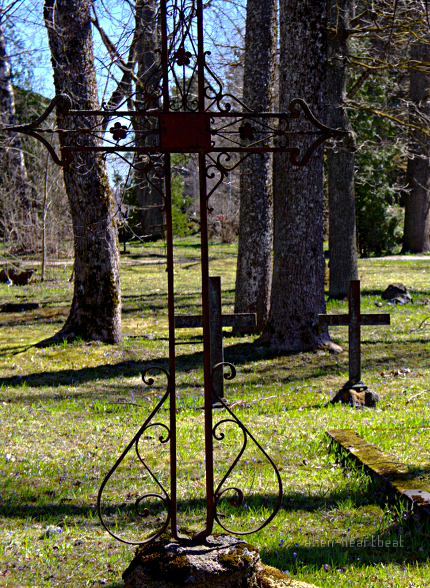 But there are also many rusting metal crosses carrying no names. I guess something bad happened here once. And if you read the history of Estonia, and the long oppression of its people, there is no shortage of candidates. “Vohma small place, only have cows… & pigs. She has come to the conclusion that I am not very bright. Next morning a transparent half-moon in a cold blue sky. Pine trees. Old women walking bicycles, sweeping steps. Early morning is a time for old women. And a cool time for walking. Lovely writing. Reading this piece, I was right there in Estonia with you. thanks. not much happened. just quiet days walking. Or maybe she’s not used to younger people who like to walk. Walking is cool. Even so, she still made me breakfast. It is amazing how surreal real can be. Your travels are fascinating and I can imagine you saying “someone has to do it”. Great for the rest of us that you are someone with eyes and ears, an ability to write and record what you see and a sense of humour in spite of your ability to observe the darker side of life. Many thanks for taking time to visit and Like dragonshades. thanks. the darker side always presses in no matter how much we want to avoid seeing it. I like your Scottish Highland shots, esp the roads and the gardens. Scotland is not a country for the faint hearted. The scenery is magnificent and the Nature unforgiving of the casual visitor who wanders unprepared into the mountains. Few people who live under mountains actually climb them prefering to view them with awe and appreciation from the roadside. Gardens are palaces of illusion in constant flux with the changing season, a delight to the senses and a balm for the soul. Many thanks for your remarks. Greeting to the North Nofolk Coast. Somehow I had imagined you living in the north of Norway. This place seemed lonely and sad. How do you keep up? I would be in depression. well, it was spring and cool and sunny, so quite pleasant. But some places in Armenia did really depress me I have to admit. But it was early winter, which makes it worse. It’s a really sad place with so much history to learn. “Early morning is a time for old women.” A universal truth. It was also so in Taiwan… and Hong Kong, and everywhere I’ve been. A lovely post as always. Thank you. Thanks Jessica. amazing how we stumble upon these truths, and only realise them later. I’ve been an old woman for a long time, it seems. The early morning hours have always been my favourite time of day, and night. Lovely photos and writing. Again, the reflections, exquisite. Some things about being an old man I do look forward to – perhaps a bit more wisdom and understanding. These have come to me quite late.